Built using Microsoft's now-obsolete Kinect peripheral, the system monitors for and detects freezing of gait (FOG) in Parkinson's patients. When an occurrence is observed a laser casts visual cues on the floor according to the patient's location, helping them release their gait and improve their movement. It's hoped the system, which was unveiled in the Journal of Disability and Rehabilitation: Assistive Technology and supported by Parkinson's UK, can be further developed for installing in patients' homes. "Freezing of gait is one of the most disabling symptoms in people with Parkinson's, affecting its sufferers by impacting their gait performance and locomotion," said Dr Amin Amini, a researcher from Brunel's Department of Electronic and Computer Engineering, who lead the research. "It is an episodic phenomenon that prevents the initiation or continuation of a patient's locomotion, and it may lead to a loss of independence or frequent falls." The system, whose prototype cost just £137 to build, excluding its controlling PC, works by monitoring a patient's leg movements in their own home. Whilst similar systems using Kinect have been tested previously, the new system specifically monitors the angle of the patient's knee and their head direction, offering increased accuracy and a reduction in false positives. "The main reason that Microsoft Kinect was used is that it doesn't require the patients to attach any sensors to their bodies in order for the system to detect FOGs," said Dr Amini, who completed the research as part of his PhD, under the supervision of Dr Konstantinos Banitsas. 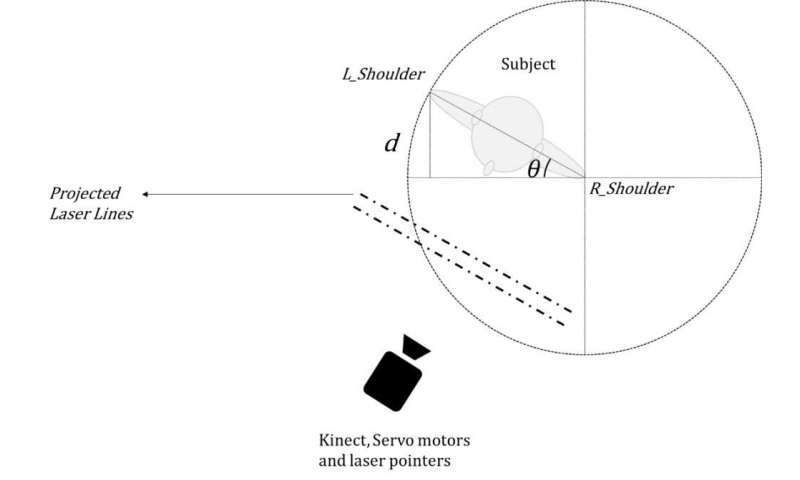 "The Kinect can unobtrusively detect and track subjects' body movements without any attachments, which makes it an ideal device for such applications." "We tested the system's capabilities and detection success rate by inviting healthy participants during the prototype phase, as well as inviting real Parkinson's disease patients to a focus group, where we demonstrated our system in action," said Dr Amini. "The results showed the possibility of employing the system as an indoor and on-demand visual cue system for people with Parkinson's, that does not rely on the subject's input or introduce any additional complexities to operate. "Despite limitations regarding its outdoor use, feedback was very positive in terms of domestic usability and convenience, with people with Parkinson's showing interest in installing and using the system at their homes." Kinect4FOG: monitoring and improving mobility in people with Parkinson's using a novel system incorporating the Microsoft Kinect v2 is published in the Disability and Rehabilitation: Assistive Technology.